November, 1999 Various ISI® databases are used to provide worldwide comparisons of productivity, impact, and language. It has been more than 30 years since my first visit to Japan. A few here today may remember the seminar I conducted for Japanese industrial firms which was organized in Osaka by my friend Takao Yamakawa of USACO. We remained good friends until his death. Afterwards, I often met with his son Takashi and I look forward to seeing him again today. I want to tell you a story never heard before in public. At the international conference on scientific information held in Cairo in 1981, USACO representatives attended. Takashi knew that I enjoyed Japanese plum wine. So his colleagues presented me with a bottle. However, I did not open the bottle expecting to share it with my family when I returned home. After the Cairo meeting, I left for Saudi Arabia where I was scheduled to give a lecture tour. When I arrived in Dhahran, I was met by Professor Hassan El-Munshid, and was immediately driven to town. Upon my departure to Riyadh, the customs inspectors at the airport opened my suitcase and found the bottle of plum wine. Since the label was in Japanese, I tried to convince them it was not alcoholic. They not only did not believe me but they made me miss my plane over the protests of my host and called the police. A few hours later, a police lieutenant arrived. He confiscated the bottle and fined me $100. This was certainly an expensive bottle of plum wine. Nevertheless, I still enjoy plum wine and often wonder how that particular bottle would have tasted. I also remember that in the 1960s Japan was, in one respect, like France and Russia. Most scientists could read English but not too many understood spoken English. At my lecture in Osaka, Dr. Ishigami of Shionogi Pharmaceuticals provided simultaneous translation as we are doing today. As a gesture of politeness, I read a few opening remarks in Japanese. Amerika-jin no nihongó eno osore ga seitoh de náikóto ni kigatsukí mashta nihongo no yami-kakí wa taihén nánodes. Forgive me if I return to English to spare you the agony of hearing my fractured Japanese. A great deal has changed in the world in 30 years. Today many Japanese, French, and Russian scientists not only read and even speak English -- they also publish in English. As I said a few years ago, in a talk before the American Association for the Advancement of Science, the number of Japanese language articles covered by ISI over a 25-year period remained almost identical even though the number of articles published by Japanese scientists increased by four hundred percent. The number of articles published by Japanese scientists in English in that period went from 20,000 in 1977 to about 80,000 in 1998. Figure 1 shows how English has become the lingua franca of science. This trend began after World War II and has continued to accelerate over the past twenty years. 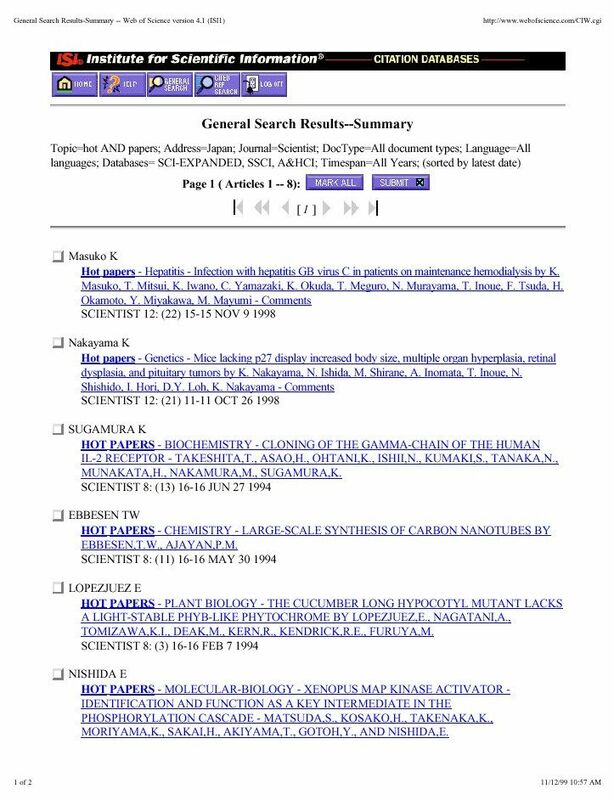 For 1997, 95% of the articles indexed in the SCI were published in English. Of the 925,000 SCI articles included in the Web of Science® in 1997, half are from the English-speaking countries like the USA, UK, Canada, and Australia. The remaining half is from other countries where English is not the native language. Only 5% of the SCI® indexed articles are published in Chinese, French, German, Italian, Japanese, Spanish, and Russian. Non-US scientists publish more in English than in any of these vernacular languages. A further confirmation of this trend is reflected in Medline. Over 90% of articles in Medline are in English. The difference of 5% between Medline and the SCI is to be found in the large number of low-impact clinical journals published in local languages. Many of these would also be covered in Embase. But any of these journals may also be cited in SCI. Their low impact indicates they have little impact on research. Figure 2 reiterates what I have said about the non-English European language representation in the SCI. It has changed significantly over the past 20 years for the seven languages. For example, German language publication has dropped from about 6% to 1.5%. French has dropped from 4.5% to 1%. Japanese language papers dropped from 1/2% to about 1/4%. In contrast to local language, Figure #3 presents the total publication output for each of these seven countries, regardless of language. The drop in output for Russia is due in part to the breakup of the USSR. But Russian science is clearly not growing at a significant rate. Japan is now the largest contributor to the world's science publication except for the United States. In 1998, the total number of published items was 6,000 higher than England. But if you include Northern Ireland, Scotland and Wales, the UK total is about 90,000. It is important to remember that ISI indexes journals from cover to cover. Therefore, it includes not only research articles but also many other types of editorial material such as letters and commentaries. The research productivity is mainly reflected in the number of research articles published. The number of published items classified as research articles from Japan was in fact about equal to the output from the British Isles. U.K. authors write many more letters in journals like NEJM, Lancet, Science, and Nature than Japanese authors. Western authors also publish more review articles. Japan went from 22,500 papers per year in 1977 to 78,500 in 1998 � more than tripling (Blue Line). Percentage wise, Japan went from over 4% to over 8% (8.21%) -- doubling its fraction of worldwide output (Red Line). 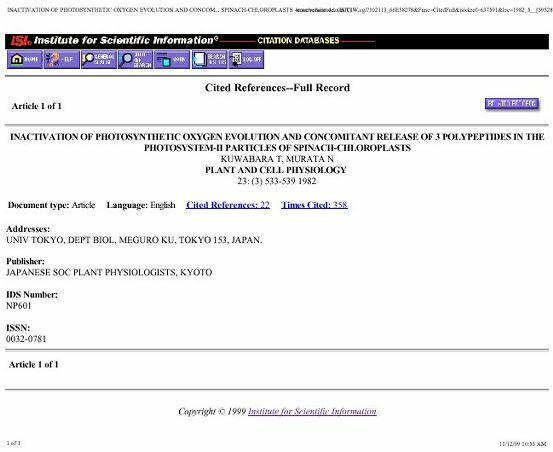 Figure 6: JAPANESE PAPERS - CO-AUTHORSHIP WITH OTHER COUNTRIES IN 1998. There has been a large increase in multi-national studies. In 1998, the U.S. was Japan's leading research partner with over 6,000 collaborative papers. This U.S. co-authorship is even large than with all other Asian nations combined. Using the ISI database called National Science Indicators, it is possible to measure citations to all Japanese papers in rolling five-year periods. This growth in citations parallels the growth in papers published. The five-year numbers smooth out year-to-year fluctuations which may be due to a number of variables. All national citation counts increase as the size of the literature increases but some achieve even greater impact. It is true that the impact of Japanese papers has increased over the years but part of this growth is due to the overall growth of the literature. Here is a table taken from the 1997 Guide to the Science Citation Index. This shows the number of cited items and citations in the ISI database for 1990 to the present. Garfield's "constant" is marked. This "constant" is actually a ratio. The total citations entered into the database each year is divided by the number of unique items cited. Garfield's constant has been published in SCI from 1945 to the present. The average paper cited in the 1945 SCI was cited 1.33 times that year. It has increased each year. By 1981 it was 1.99 and 2.44 in 1997. This should not be confused with my law of concentration first reported in Current Contents® in 1971 and applied in my 1972 paper in Science entitled "Citation analysis as a tool in journal evaluation." This paper is cited frequently by most journal editors in discussing the ubiquitous journal impact factor. The law of concentration is related to Bradford's Law of Scattering. The general growth in these curves is in part due to the overall growth of the literature. In our National Science Indicators file, we calculate relative impact factors for each country. 1.0 is the average worldwide. It would require some careful analysis to determine why Japan's relative impact -- that is in relation to the rest of the world -- is just below average. And as we have increased the number of Japanese papers we are drawing on more of the lower impact journals. However, as will be seen later, the performance of Japanese science varies from field to field. Undoubtedly, there is some loss of citation impact for any references to articles published in Japanese, Chinese, etc. In this slide the number of substantive research articles and reviews is reported in contrast to the number of published items. That is why the number for 1998 for Japan is about 14,000 less than the total presented earlier. This lower number does not included here are abstracts, letters, and other editorial items. Since the National Science Indicators database includes only research papers and excludes abstracts, letters, etc. Japan's percentage of worldwide output is even higher and represents almost 10%. Percentagewise, materials science is clearly one of Japan's strongest areas. Japan produces 15% of the research papers but its relative impact is .93. Chemistry, agriculture, and physics also exhibit high percent of Japanese papers and relatively high impact. As some of you will be aware, ISI publishes Science Watch every two months. It includes many interesting articles providing scientometric analyses based on the various ISI databases. Last month, it published a worldwide analysis of physics papers where it can be seen that the Asian sphere has grown while the U.S. share has declined. Some of you may have attended our ISI Roundtable briefing held in Osaka last year in July. The following list of companies in the pharmaceutical and chemical industries were included in the following analysis. Shinogi produced the most papers but the impact for Takeda is almost 15.0. 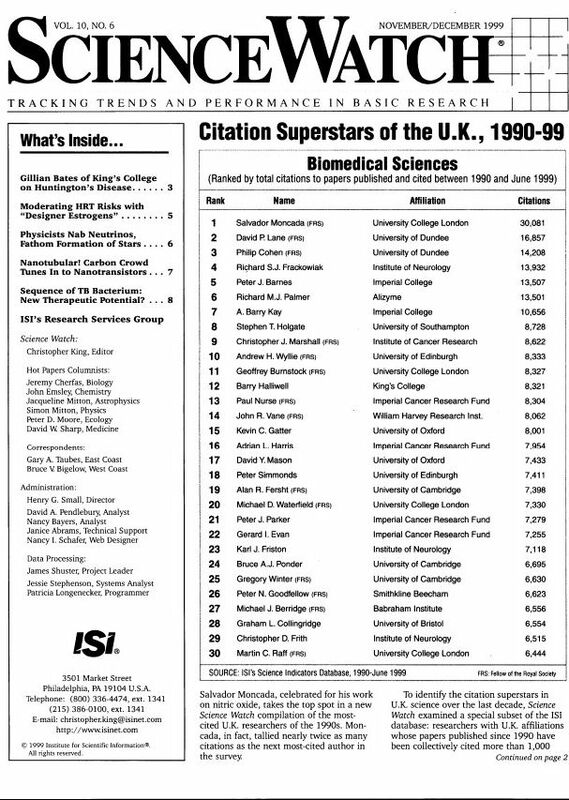 These were the most-cited authors for 1981-1997 for the pharm-chem industries..
And these were the individual papers most-cited -- all of Citation Classic quality and also mainly in the area of biotechnology. Here is the result of the analysis ranked by number of papers. I've given you a somewhat random selection of the possibilities using ISI databases for science policy purposes. This kind of scientific intelligence can be applied in a variety of situations from stock analysis to tenure evaluation in universities. The creation of the SCI gave birth to the field of scientometrics as well as a journal by that name. A bibliography of this field would include over 5,000 articles. If there had been more time, I would have liked to prepare a co-citation map of Japanese science which would present in a multi-dimensional way the place of Japanese work in worldwide research. This analysis would show the specific role of Japanese scientists within the 10,000 research fronts that ISI identifies each year and represent a virtual Atlas of Science. I realize that I have not spoken about the primary use of the Web of Science for information retrieval. There are now millions of students, faculty, and researchers using this worldwide web internet service. It has brought about a fundamental change in the way researchers function, since it has removed the physical and psychological barriers to using databases. I myself use the Web of Science several times each day to obtain an immediate picture of any topic that comes up. Combined with linkage to full text of journal articles, I can navigate ideas in real time. Full-text searching adds to the level of specificity one wishes that go beyond abstracts and ordinary indexes. Let me invite you to try this with my own personal database where you can search the full text of my published work at www.garfield.library.upenn.edu. From the outset, the SCI was the first virtual worldwide web. It was always described in terms of the linkages between citing and cited documents. This was first demonstrated in the CD-ROM version of SCI and then fully realized in the Web of Science. As many of you know Current Contents used to have a feature called Citation Classics. You can search for these 4,000 papers and books on the Web of Science. These were unique personal commentaries by the authors of highly cited papers. Here is a small sample of the 75 papers that were written by Japanese authors. I have a copy of this list with me. However, time will only permit me to show you the first page. By searching the SCI database, it is simple to identify these highly-cited works by Japanese authors. Time will not permit me to show you all 75 but I have the printout with me. 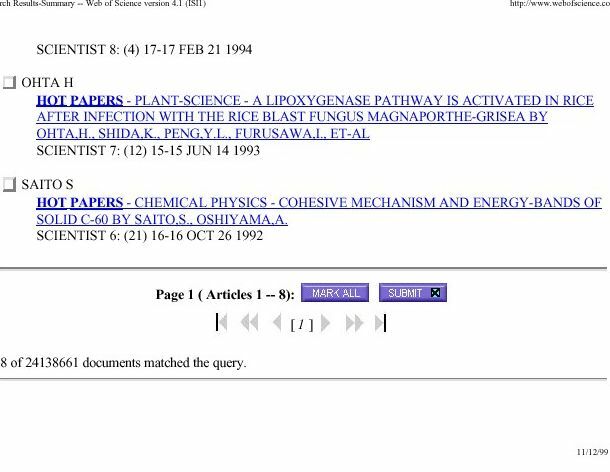 Using the first entry for Tomohiko Kuwabara of the University of Tokyo, I have found the original paper in the Web of Science. 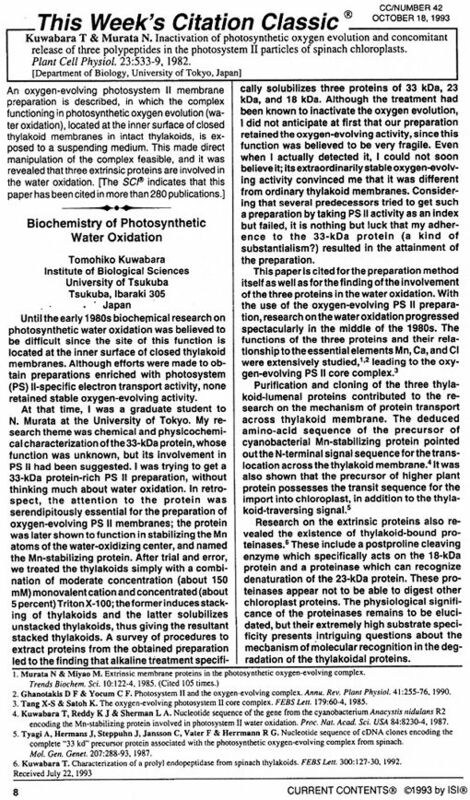 It has been cited 358 times since it was published in 1982 in Plant and Cell Physiology. Here is the actual text of the commentary by Kuwabara in Current Contents in 1993. 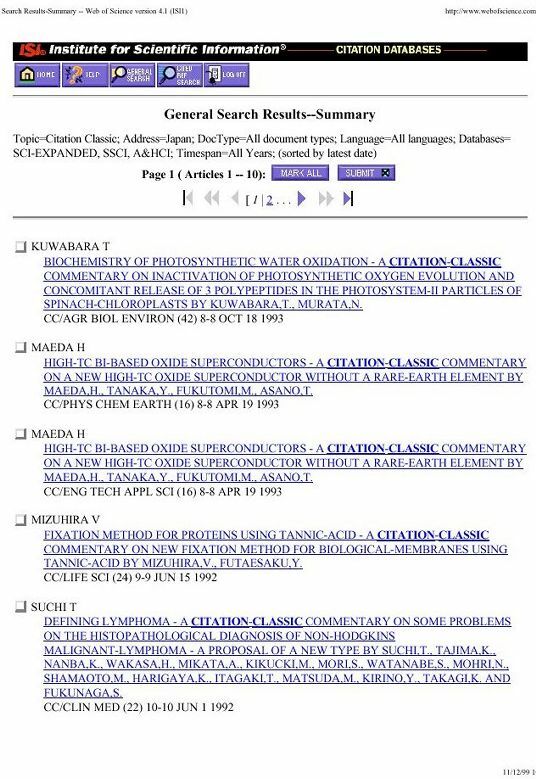 In 1986, a variant on Citation Classics was added to the editorial pages of The Scientist, a news journal for scientists which was started thirteen years ago. This feature is also called "Hot Papers". These are papers that were highly cited during the past one or two years. The authors are interviewed and asked to provide personal comments on why the papers are so popular. Again, I have searched the Web of Science to find this list of eight hot papers from Japan. In 1990, ISI began to publish Science Watch. From the outset, hot papers were listed in Science Watch. Each issue covered a different category such as biology, physics, chemistry, and medicine. The same database used in the selection of hot papers for Science Watch is also used by The Scientist to identify authors to be interviewed. or The Scientist, 3600 Market Street, Suite 450, Philadelphia, PA 19104, U.S.A. Here you can see the contents page from The Scientist announcing the hot paper by Kazuo Sugamura. T. Takeshita, H. Asao, K. Ohtani, N. Ishii, S. Kumaki, N. Tanaka, H. Munakata, M. Nakamura, K. Sugamura, "Cloning of the g chain of the human IL-2 receptor," Science, 257:379- 82, 1992. Kazuo Sugamura (Department of Microbiology, Tohoku University School of Medicine, Sendai, Japan): "Prior to this study, we had established monoclonal antibodies specific for the b chain of the receptor for interleukin 2 (IL-2), also known as a T cell growth factor. A series of experiments with these monoclonal antibodies provided evidence that the functional IL-2 receptor includes a third novel component, the g chain, in addition to the a and a chains. In this study, a complete cDNA clone of the g chain gene was isolated and characterized as a new member of the cytokine receptor family. The g chain, like the a chain, was shown to be an indispensable subunit for the functional IL-2 receptor. Interestingly, the g chain gene was mapped to a locus on the X chromosome (Xq13) where the putative gene for X-linked severe combined immunodeficiency (XSCID) is located. Furthermore, mutations of the g chain gene were demonstrated in patients with XSCID (M. Noguchi et al., Cell, 73:147-57, 1993). XSCID is characterized by markedly reduced levels or complete absence of T cells that play pivotal roles in the immune system. Therefore, it is evident that abnormality of the g chain causes an impairment of early T cell development, resulting in XSCID. "The g chain was originally identified as an essential component of the receptor complex for IL-2. However, since patients and mice lacking IL-2 production generate mature T cells, it could be speculated that the g chain may be a component of receptors for other cytokines. In this context, we have already demonstrated that the g chain participates in the formation of functional receptors for IL-4 and IL-7, as well as IL-2 (M. Kondo et al., Science, 262:1874-77, 1993 and 263:1453-4, 1994). The study of such cytokines interacting with the common g chain accentuates the urgent need to resolve the mechanism of early T cell development. "Currently, only bone marrow transplantation has lent dividends in curing patients with XSCID. Since XSCID is caused by mutation of a single gene, the g chain gene, introduction of the normal g chain gene into bone marrow cells of patients with XSCID could probably lead to gene therapy of patients with XSCID--as in the case of adenosine deaminase deficiency, which has been successfully corrected by gene therapy. "Thus, the discovery and molecular characterization of the g chain gene has brought us a breakthrough in studying the rather intricate patterns involved in T cell development, and has provided a practical tool for gene therapy for XSCID." Here is a printout from the WWW version of The Scientist for June 27, 1984. 269 47 Heldin CH, Miyazono K, Tendijke P TGF-Beta Signaling From Cell-Membrane To Nucleus Through SMAD Proteins. Cleavage Of CAD Inhibitor In CAD Activation And DNA-Degradation During Apoptosis. 143 38 Fukuda Y, Hayakawa T, Ichihara E, Inoue K, Ishihara K, Ishino H, Itow Y, Kajita T, et al. Evidence for Oscillation of Atmospheric Neutrinos. 140 24 Cheng EHY, Kirsch DG, Clem RJ, Ravi R, Kastan MB, Bedi A., Ueno K, et al. DNA Damage-Induced Phosphorylation of P53 Alleviates Inhibition By MDM2. 115 15 Fukuda M, Asano S, Nakamura T, Adachi M, Yoshida M, Yanagida M, et al. CRM1 Is Responsible For Intracellular-Transport Mediated By The Nuclear Export Signal. 110 22 Yasuda H, Shima N, Nakagawa N, Yamaguchi K, Kinosaki M, Mochizuki S, et al. Factor and is Identifal to Trance/Rankl. 59 13 Fukuda Y, Kayakawa T, Ichihara E, Inoue K, Ishihara K, Ishino H, Itow Y, Kajita T, et al. Measurement Of A Small Atmospheric NU(MU)/NU(E) Ratio. 50 12 Fukuda Y, Hayakawa T, Ichihara E, Inoue K, Ishihara K, Ishino H, Itow Y, Kajita T, et al. Measurements of the Solar-Neutrino Flux from Super-Kamiokande First 300 Days. Tokyo Inst Technol, Tokai Univ, Univ Warsaw, Boston Univ, Brookhaven Natl Lab, Univ Calif.
49 17 Fukuda Y, Hayakawa T, Ichihara E, Inoue K, Ishihara K, Ishino H, Itow Y, Kajita T, et al. Study of the Atmospheric Neutrino Flux in the Multi-Gev Energy-Range. Carrier-Based Ion-Selective Electrodes and Bulk Optodes - 1 - General-Characteristics. 40 14 Yamada K, Lee CH, Kurahashi K, Wada J, Wakimoto S, Ueki S, Kimura H, et al. The Superconducting-Transition Temperature In La2-Xsrxcuo4. 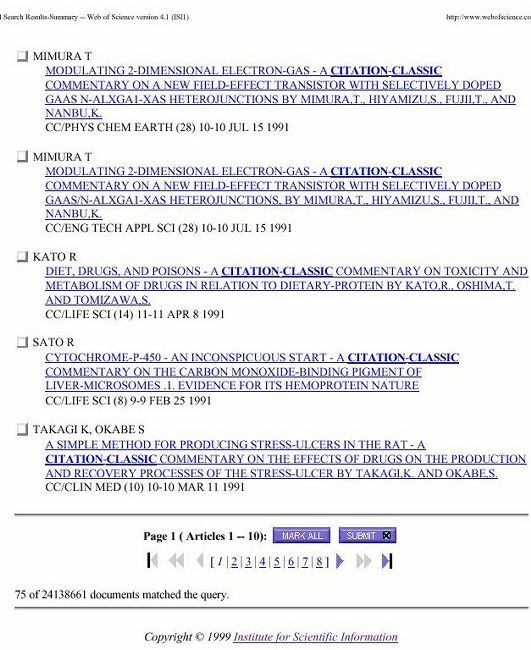 Papers CD-ROM (99-5) which lists papers published within the past two years that were highly cited in current articles during September-October 1999. Since 1997, ISI has included in each subscription to Science Watch a database of 800 hot papers which is updated every few months, it is very exciting to watch the dynamic changes in these reports of hot papers because they identify the cream of current articles representing breakthroughs in science. The ability to list hundreds of hot papers based on the last few months of citation history contradicts the common myth that it is necessary to wait many years before one can identify new research fronts and breakthroughs. While it is true that many scientific ideas are not recognized many years later, that is not true for the majority of breakthroughs. On my web page you can find dozens of studies of delayed recognition. These are arranged by the total citations these papers have received. This particular selection excludes large multi-national collaborations such as gene-sequencing and high energy physics. However, we have elected to include a few papers by Fukuda et al on neutrinos, since the experiments were performed primarily at the Super-Kamikande neutrino-detector facility. After picking off the top-cited biomedical papers we skipped over the remaining biomedical papers and selected some representative papers in physics, chemistry, materials science, etc. It is remarkable indeed that the paper by Enari et al. from Osaka University and the Kirin Brewery should achieve Citation Classic status so early in its life. Sakahira, Enari and Nagata have also authored another future classic on "CAD activation during apoptosis." This subject is of special interest to me since I recently co-authored a paper with the editor of the journal Cell Death and Differentiation, Dr. Gerry Melino of the University of Rome at Tor Vergata. This paper provided a mapping of the growth of apoptosis (cell death) research. These historical exercises would be impossible without the ISI specialized databases which identify new research fronts every year. In the future, it will be possible to "seed" these core papers into mapping algorithms such as SCIMAP. Future algorithms will show how the literature of a field progresses from these starting points to future key papers and thus demonstrate, graphically, their impact on future research. These exercises in historiography were performed by my students when I was teaching. My colleagues and I created similar historiographs in the sixties when we traced the early developments in the history of DNA. Now the visualization of citation networks has been made practical by the availability of gigabyte memories. Bibliographic mapping will become a routine part of research in the near future and will help solve the problem of information overload. It will be much easier for future researchers, historians and reviewers since ISI's files begin with the post-war period, 1945 onwards to mine the data buried in the historical record. One day soon the data for 1945-69 will be added to the existing coverage of Web of Science which starts with 1970. In combination with Derwent's Patent Information it is now possible to do some extraordinary studies in the history of science and technology.